RUSH: Here’s Carmen in Mansfield, Ohio, as we continue on the phones on Open Line Friday. Hi. CALLER: Oh, my gosh. Hi. RUSH: Oh, my God. Oh, my God. Hi. Hi. How are you? Carmen, it says up there you’re 11? RUSH: — if you hadn’t said so. You don’t sound like you’re 11. You sound older than that. CALLER: Oh, thanks. I always sound like a baby on the phone. So I was just calling to say how much I enjoyed reading your book, Rush Revere and the Presidency, and I did a book report on it, and it made like reading a lot more fun ’cause reading is usually really boring, and I got an A+ on my book report from reading that. RUSH: Hey, Carmen, can I ask you a question about your book report? RUSH: How many pages was it? CALLER: It was only one page. RUSH: A one-page book report, you got an A+ on it, you summarized a 200-page book in one page, and you got an A+ on it. RUSH: That’s fascinating. And I don’t doubt that your book report encompassed the premise and the things that you got out of it because it’s entirely possible to do that. Have you read the other books or just that one? CALLER: No. I couldn’t find them anywhere else ’cause I got it for Christmas, and, you know, my grandparents couldn’t remember where they got it from. RUSH: Your grandparents couldn’t remember where they got it. RUSH: Well, let’s see here. You’ve not read the first one, you’ve not read Rush Revere and the Brave Pilgrims? CALLER: Nope. That’s the only one I’ve read, but I really liked it. 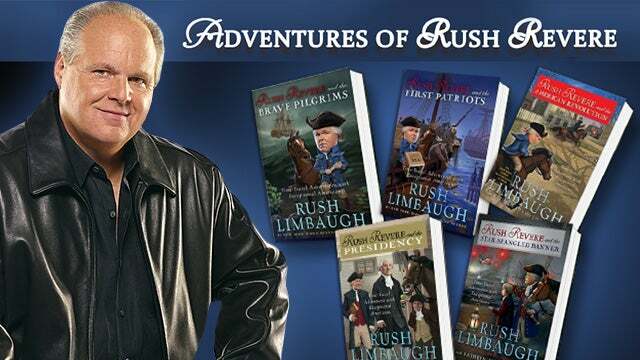 RUSH: You read the Brave Pilgrims or the presidency? CALLER: I read the presidency one. RUSH: Right. Well, that is good. That is good. Did you note that we spent a lot of time in that book chronicling the importance of the wives of these presidents? RUSH: — your favorite character would be me, Rush Revere, right? CALLER: Well, I kind of like Liberty a lot because horses are my favorite animal. RUSH: — you’ll probably like this for a few more years, you’ll probably like it hanging around in the bedroom. I’ll tell you what I’m gonna do. I’m gonna put you on hold here and then Greg will be back and answer your call here and we’ll get your address so that we can send you a complete package of stuff from Rush Revere and Liberty. We’ll send you the rest of the books, and we’ll send you the CDs, the audio versions of each, which feature me reading the books, if you ever want to take time off from reading. You can listen to them, the audio version, and some other good stuff. We love sending this stuff out to people that love the books. So that’s good. So would your parents mind if I send you a bunch of stuff like that? RUSH: Wonderful. That’s good. Always need to get the parents’ permission with things like this. So that’s great to know. So hang on here, Carmen. Thank you so much. It’s great that you were able to write a one-page book report. I have a private reason for thinking that that’s a big deal. And if you hang on we’ll get your address and we’ll get this stuff out to you next week, including the other four books in the series.